If you grew up in the 90’s like me, Tetris was an integral part of your childhood. 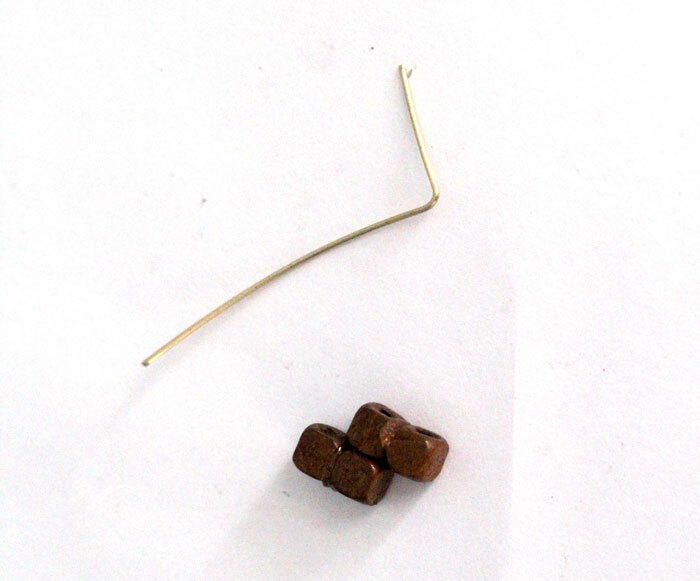 This DIY Tetris jewelry is inspired by the Tetris pieces in that game that we all loved/obsessed over. I am really a geek at heart, and find it frustrating when so many “geek” stuff are geared toward guys. 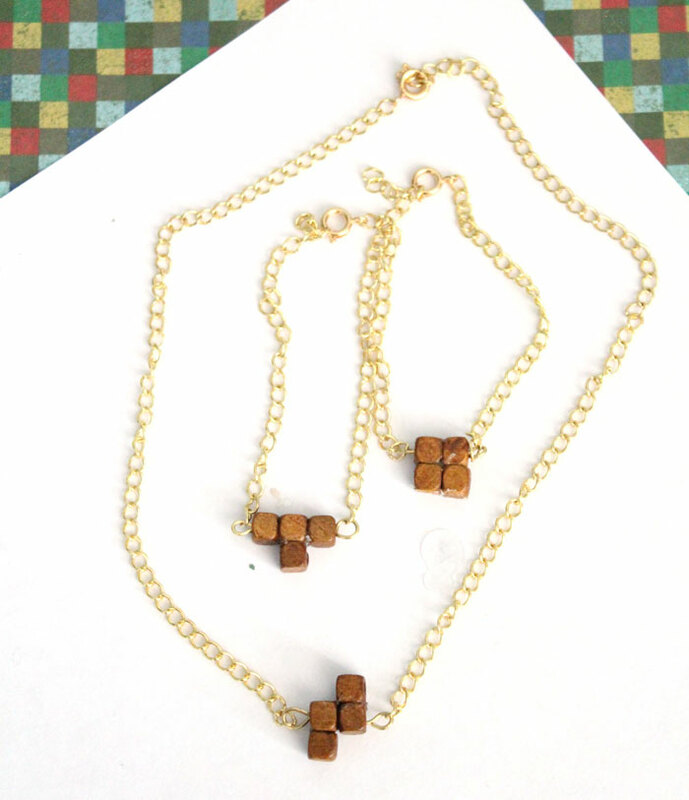 This Tetris jewelry was made with the girly geek in mind, and goes perfectly with the Tetris magnets I posted a while back. 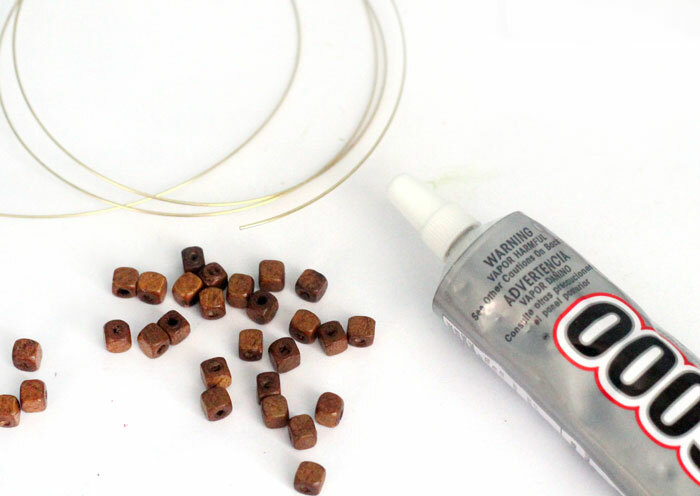 If you’ve got a good stash of jewelry making supplies, you probably have what you need to start. 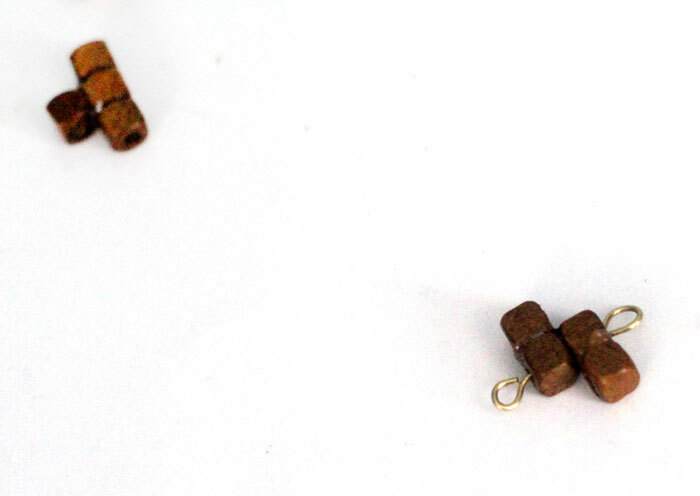 In addition to basic wire, chain, glue, and pliers, you’ll need these wooden beads. I made these in a dark wood stain color to make it more serious. If you want it “just for fun” use colorful beads. It will cost you literally pennies to make, and it is most definitely giftable. 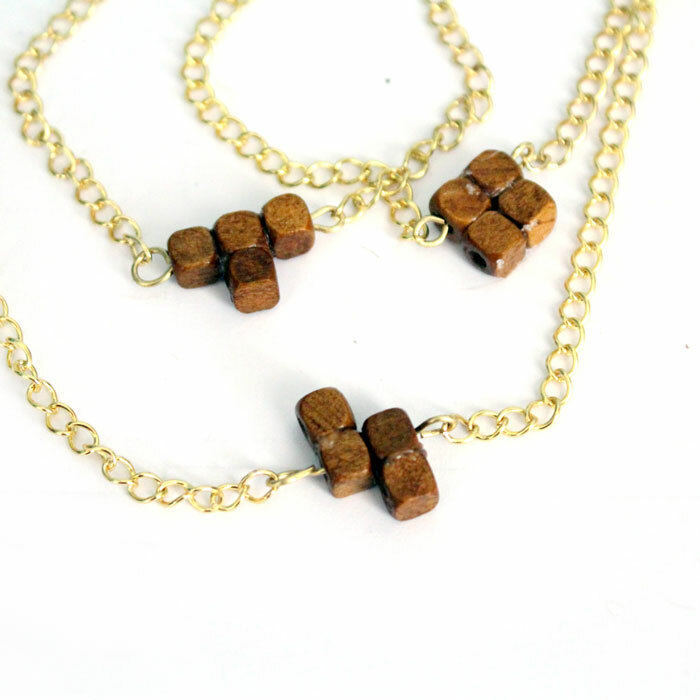 As a matter of fact, this Tetris jewelry makes a perfect cheap gift idea for any fan! If you don’t have all the supplies, I’ve created a list below. It will still cost you pennies considering that you can make a lot with one set of supplies (or save the leftovers for other projects.) Upgrade it a bit and use gold-filled materials with a thinner chain, and it makes an upgraded chicer gift. It will still cost only a few dollars a piece. I made a set of bracelets that look beautiful stacked or alone. The necklace is short, and sits just below my neck. They are both totally classy in a slightly geeky way. They are my new favorites! 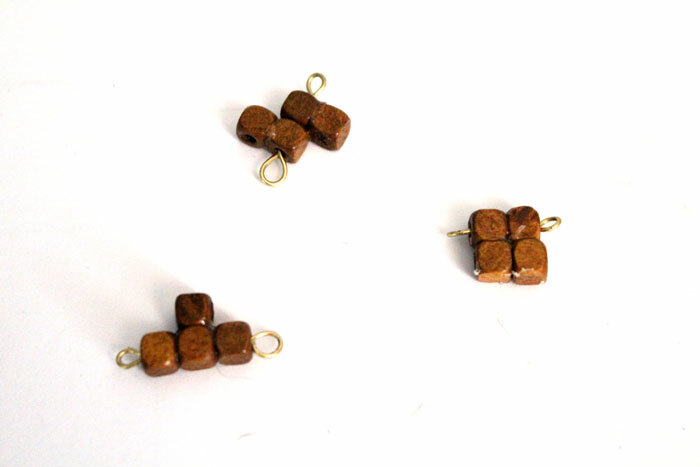 I kept the steps for connecting the chain to the Tetris pieces and clasp very simple, but if you want to use a more delicate chain you can. You’ll just need to use jump rings to connect it, and add a bit of twisted cable chain to the end for the clasp extender. 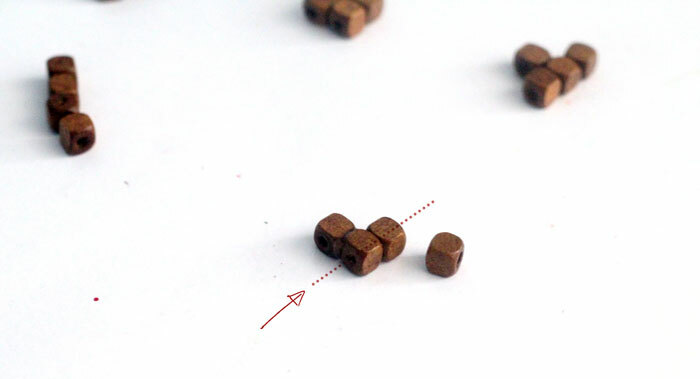 Plan your beads for your favorite Tetris pieces. You actually might not want to use your favorites (like the line) and opt for the ones with more interest. 2. Before you glue them, make sure that the holes align. It’s really easy – they just need to be in the same direction. 3. Gue your pieces together. 4. 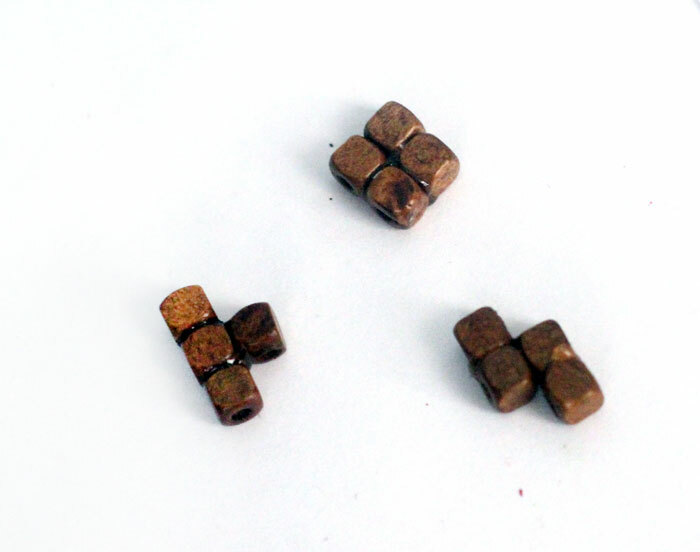 Cut a piece of wire long enough to go through the beads , plus 8mm on each side (you can guesstimate and trim later). Bend it at a 90 degree angle. 5. Curl it to form a loop. 6. Repeat it on the other side. If you are using an eyepin, you’ll skip steps 4-5 and just do this part. 7. Repeat for any Tetris pieces you plan to use. 8. 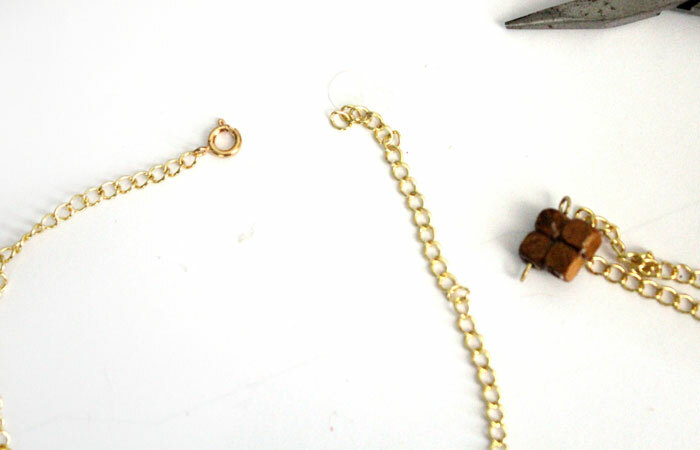 Attach a single piece of chain long enough to fit around your neck (or wrist), plus an inch. Measurements include the width of the piece. Connect the chain on both ends, to either side of your Tetris piece. 9. Split the chain slightly off center, and attach your clasp. You now have a little leeway with size, as you can close it on any hole of the chain. 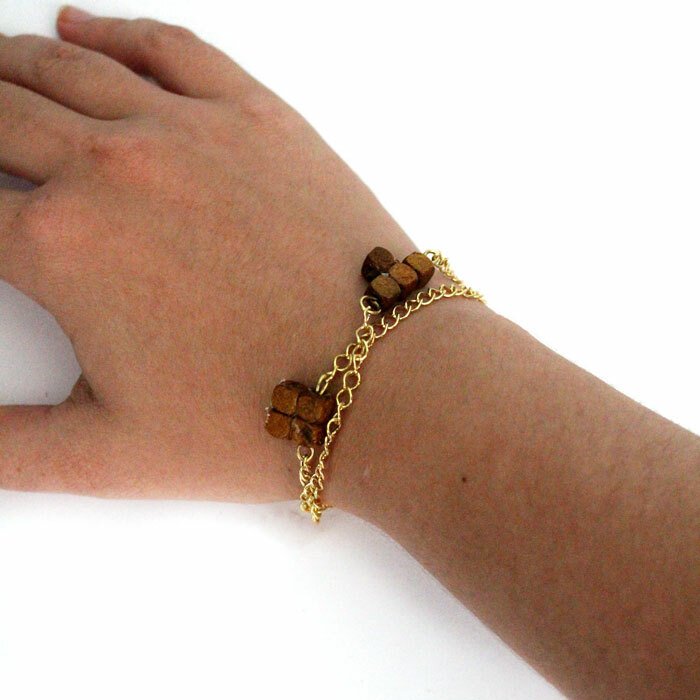 You can even use the necklace as a bracelet, by wrapping it a few times around your wrist. Wear it with pride! You made something beautiful. If you want to gift it, you can even download these free pillow boxes to use. 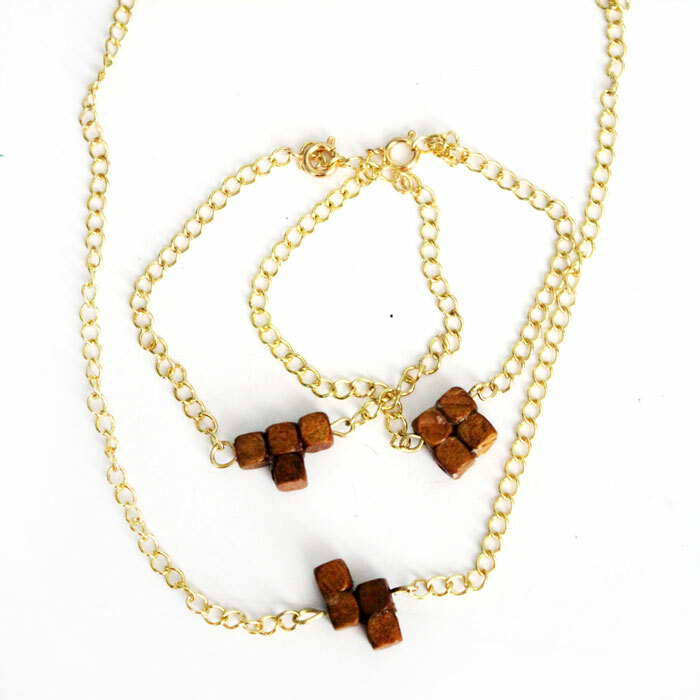 The Tetris bracelets look great worn in pairs, and beautiful worn high on the chest. I haven’t tried it, but I’m sure the necklace would look great layered as well, as it’s a very simple design. Did you play Tetris as a child or teen? 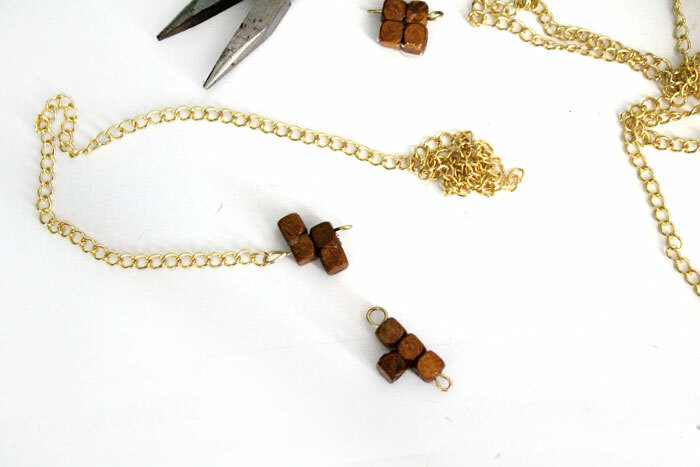 Who will you be making this Tetris jewelry for? Comment below! Crafts for Teens, Crafts for tweens, Jewelry Making Crafts, Quick and easy crafts. Bookmark. Thanks! Yeah, I wish I had a good alternative! 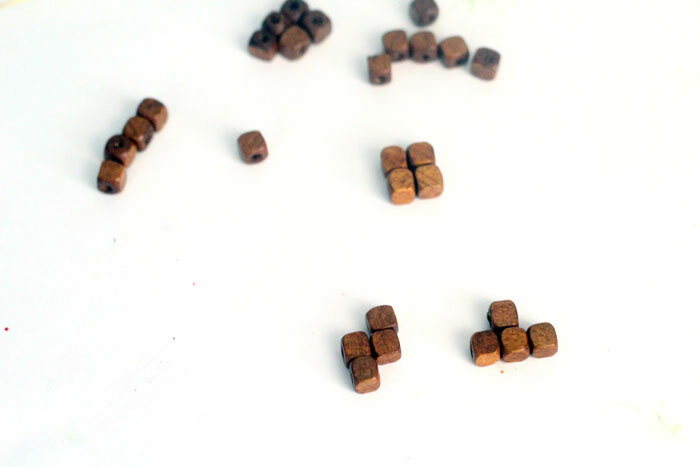 For this craft you CAN use wood glue and it should stick fine (even though the wood is finished. It’s lightweight enough to hold). You can also try this one with Tacky glue since it’s lightweight. That being said, when I need to really rely on it, I still use E6000 for lack of a better alternative. Good ventilation is definitely key!